The Treasury Bill & Bond Tap Facility is part of the Bank of PNG’s liquidity management tools used to influence the price of money (interest rates) so as to achieve its objective of price stability. Treasury bill tap and Treasury bond tap are Bank of PNG’s stocks of Treasury Bills and Bonds issued on a Tap basis (over the counter) to investor s at a pre-determined price or yield. Tbill-tap is a discount bill with terms less than 1 year of maturity. It is purchased at a discounted price, accrues interest daily until it reaches full face value on maturity. Tbond-tap is the fixed income bond that pays coupon interest on a six monthly basis over the term of the bond. It has maturities for 2 years and more and can be purchased at par or face value on maturity. The objective of offering the Tap facility is to support the development of the secondary market for the trading of government securities and to encourage a savings culture. This market provides an avenue for investors to meet their liquidity needs through the buying and selling of these securities. The minimum amount to invest is K5, 000.00 and it is open to the general public including individuals, private companies, church groups, government employees (individuals) and others. Government agencies or institutions are also allowed to invest. Registered Bidders are not allowed to participate in the Tap Facility. Trading is conducted on Mondays to Fridays from 10 am – 2 pm at the Bank of PNG, Port Moresby. Investors outside of Port Moresby can also purchase or invest in the T-bill and T-bond tap facility. 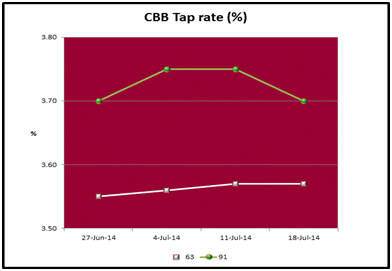 Tap rates are fixed and can be obtained from the Bank weekly.